Wow, today it’s a posting day! lol But since these are all already done I can upload the pictures and serve it with some text… All the diagrams come from Mio TSUGAWA site: the kusudama. Again twelve units but assembled diferently. This one no longer resemble a cube. I’m never going to use this paper again. It’s really hard to fold neatly and if make a mistake it’s bye bye unit! This one really has a nice round shape. The big was my first and the small my second. 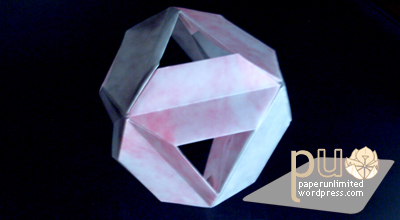 The bigger was made with 6×6 cm paper and ended with a 12 cm diameter. 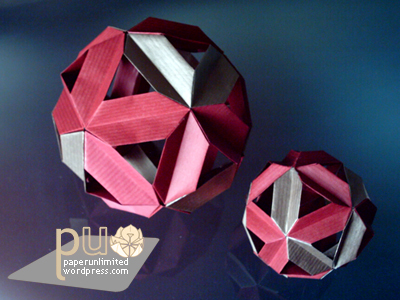 The smaller one has a diameter of 8cm (paper of 4×4 cm). 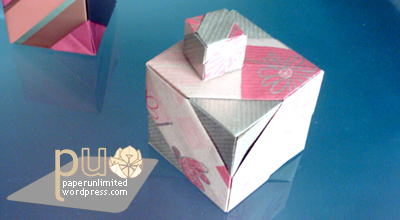 This entry was posted on 2007|01|30 at 15:40 and is filed under kusudama (glued), modular origami. You can follow any responses to this entry through the RSS 2.0 feed. You can leave a response, or trackback from your own site.